In the 1880s Jules Cotard first described his eponymous syndrome, a rare psychiatric condition with strong delusions of being dead. Aciclovir or valaciclovir may cause neuropsychiatric side effects such as confusion, somnolence, and hallucinations, mainly in patients with impaired renal function.1 To our knowledge, Cotard’s syndrome2 has never been reported as a suspected adverse drug reaction. A 35 year old woman with a failing kidney transplant was being treated with chronic haemodialysis, prednisolone (5 mg daily), and ciclosporin (50 mg daily) when she developed herpes zoster. Valaciclovir was prescribed, 1 g daily, according to standard Swedish recommendations for renal failure at the time. She took the first dose after dialysis on day one and became restless two nights later. On day three she was tired, her body felt unfamiliar, and she felt shut off from the surrounding world. That night, after a total valaciclovir dose of 3 g, she developed anxiety and visual and auditory hallucinations. When she came to the dialysis unit in the morning she could barely walk, cried out, and appeared terrified. Her mother reported that this had been present for several hours. After 45 minutes of haemodialysis her condition improved, she no longer cried out and could speak. After an hour of dialysis she explained that she had been convinced she was dead; now she was not quite so sure. After two hours she was calm and half asleep but could answer questions and said her arm seemed unfamiliar when she touched it. After three hours she could hold a short conversation but was still tired. After dialysis, she remained ataxic, had difficulty walking and told us how utterly frightening her sense of being dead had been. Valaciclovir was discontinued and she was admitted overnight. Next day she exhibited no further neuropsychiatric symptoms. We found no cause to account for her sense of being dead other than the treatment with valaciclovir. Thirty hours after the last dose her serum concentration of aciclovir before dialysis was high, at 19.4 µmol/l (close to the peak concentration one to two hours after a single dose). The serum concentration of the main metabolite, 9-carboxymethoxymethylguanine (CMMG) was also high at 90.2 µmol/l and decreased during dialysis to 21.1 µmol/l, which is still considered high (figure)⇓. On day six her serum aciclovir concentration was 1.8 µmol/l and serum concentrations of CMMG were 8.9 µmol/l before dialysis and 1.5 µmol/l after dialysis. A 36 year old man who had received a bone marrow transplant was taking ciclosporin (400 mg daily) and prednisolone (25 mg daily) and developed herpes mucositis. He was treated with oral valaciclovir 500 mg twice a day. On the sixth day of treatment he was admitted to hospital with frequent diarrhoea and dehydration but was afebrile, normotensive, and lucid. His plasma creatinine concentration was 419 µmol/l (it had been 127 µmol/l one month earlier). The next day he was confused but results of computed tomography of the brain were normal. Herpes encephalitis was suspected, and on day eight valaciclovir was replaced with intravenous aciclovir 500 mg daily. On day nine he awoke with fear, anxiety, and slurred speech; he was screaming and asking if he was dead. Intravenous diazepam resolved the symptoms only temporarily. Aciclovir was withdrawn because results of virus isolation and polymerase chain reaction in the cerebrospinal fluid were negative. The feeling of being dead reappeared the following night and he felt depressed and tired the day after. However, his confusion had subsided and his speech improved. During the next night he again believed that he was dead and considered that everybody around him was dangerous. His mental state and renal function finally returned to baseline on day 12. A blood sample 16 hours after the final dose on day nine contained 39 µmol/l of aciclovir and 29 µmol/l of CMMG. On day eight aciclovir and CMMG concentrations in the CSF were 27.5 µmol/l and 3.2 µmol/l, respectively. 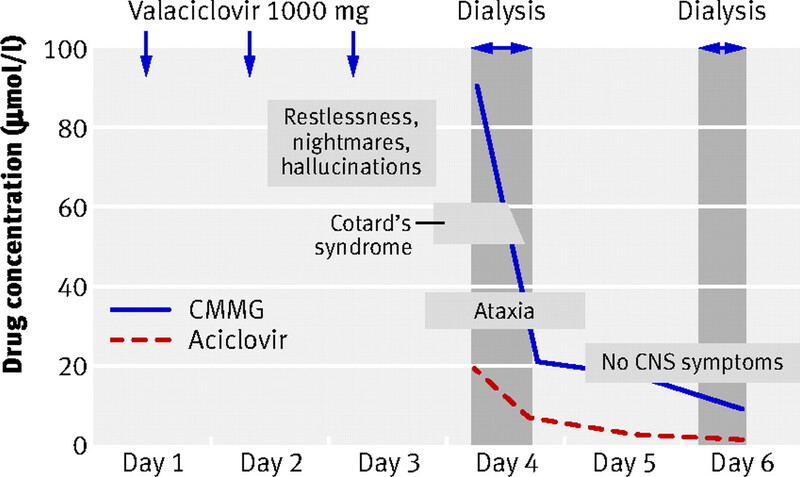 In the first patient haemodialysis resulted in rapid improvement; Cotard’s syndrome subsided and was followed by a hemineglect syndrome, similar to the alien hand syndrome.3 The serum concentrations of aciclovir and CMMG decreased substantially, though the CMMG level was still high. We have previously found concentrations >10 µmol/l to be associated with neuropsychiatric symptoms.2 The second patient also had Cotard’s syndrome at high aciclovir and CMMG concentrations and experienced slow recovery over three days as the serum concentration declined. Both patients were treated with reduced doses based on their renal impairment, as recommended at that time. Neither of them had any evidence of liver dysfunction. Cotard’s syndrome has been associated with severe somatic stress as well as general and localised cerebral pathologies.4 Our findings add adverse response to an antiviral drug as another cause and provide clues to the syndrome’s possible neuropsychiatric origin. Clinicians should be aware of the association between body scheme disturbances and (val)aciclovir. Affected patients with Cotard’s syndrome and renal failure should preferably be sent to the dialysis unit, not to the department of psychiatry. Contributors and sources: AH is working on his PhD thesis on aciclovir induced adverse drug reactions. IOC and IF were responsible for the first patient, and IOC diagnosed the valaciclovir adverse drug reaction. KL was responsible for the second patient. AH, IOC, and TL wrote the article. All have drafted the manuscript and provided final approval. This article arose from a conversation between AH and TL, TL immediately diagnosing Cotard’s syndrome from the symptoms that AH reported. AH is guarantor. Helldén A, Odar-Cederlöf I, Diener P, Barkholt L, Medin C, Svensson JO, et al. High serum concentrations of the acyclovir main metabolite 9-carboxymethoxymethylguanine in renal failure patients with acyclovir-related neuropsychiatric side effects: an observational study. Nephrol Dial Transplant2003;18:1135-41. Cotard J. Du délire des négations. Arch Neurol1882;4:152-170, 282-96. Scepkowski LA, Cronin-Golomb A. The alien hand: cases, categorizations, and anatomical correlates. Behav Cogn Neurosci Rev2003;2:261-77. Berrios GE, Luque R. Cotard’s syndrome: analysis of 100 cases. Acta Psychiatr Scand1995;91:185-8.